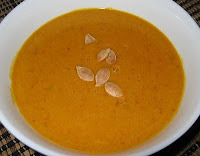 For day #29 of Soup Month, we have a very easy to prepare pumpkin soup, using just 4 ingredients. The soup contains just a bit of thai seasoning for a perfect blend of sweet and spicy. To add a tasty garnish, prepare a batch of Roasted Pumpkin Seeds in advance. Heat the thick coconut milk from the top of the can and the red curry paste and bring to a simmer for about three minutes, stirring constantly. Add the remaining coconut milk, pumpkin puree and fish sauce and bring to a boil, stirring gently to blend. Taste and adjust thai curry seasoning, adding a bit more if needed. Garnish with a few roasted pumpkin seeds and serve. Makes 2 generous bowls of soup.